Home » Italian renaissance helmet from crafted iron.16th century. Renaissance helmet. XVI Century. Italian factory. The Museum of Artillery, at Paris, is rich in arms of this kind, and it is no easy matter to make a choice amongst them. Among the helmets of Italian workmanship those we give to day have struck us as remarkable in every respect. The helmet of most perfect workmanship, is of iron chased and „repoussé“ in round boss. The crest is formed of the prostrated body of a warrior armed in the roman style, and seized by the beard by two chimeras with moment`s bodies. These chimeras hold palms in their hands. A cartouch or escutcheon is seen on the point of the beaver. 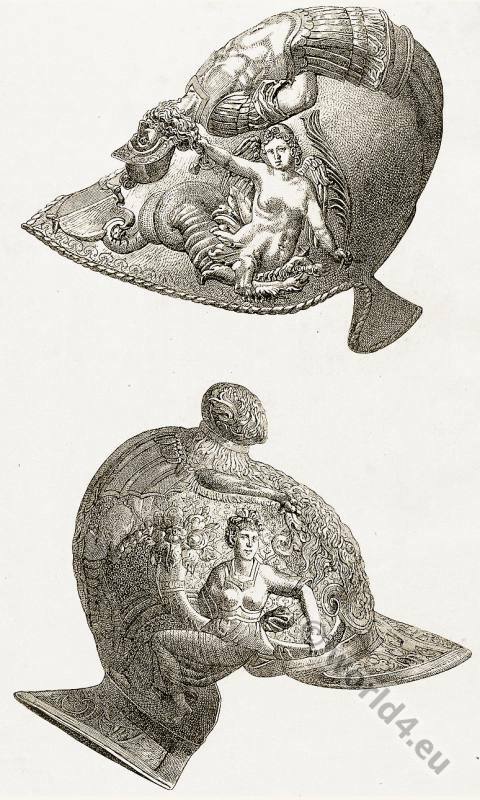 The helmet below is very different in form and somewhat less strange in decoration. Two figures holding cornucopia are the principal subject. Chiemerical ornaments accompany these figures. The whole rises from a niello ground (black mixture of copper, silver, and lead sulphides, used as an inlay on engraved or etched metal.) of interlaced ornaments. XVI Siècle. Fabrique Italienne. Musée de l’Armée, a Paris. Casque en fer ciselé. This entry was posted in 16th Century, Italy, Middle Ages, Military, Renaissance and tagged Helmet, Ornaments, Weapons on 11/17/13 by world4.